(Bloomberg) -- Michael Cohen sued the Trump Organization, claiming the president's family company stiffed him on millions of dollars in legal fees and costs. The breach-of-contract suit, filed Thursday, is likely to prolong the bitter feud between President Donald Trump and his former lawyer and fixer, who heads to prison in May. Cohen just wrapped up a series of appearances before Congress, where he impugned his ex-boss as a "racist," "con man" and "cheat," and promised to help investigators probing the president's company. "The Trump Organization agreed to indemnify Mr. Cohen and to pay attorneys' fees and costs incurred by Mr. Cohen in connection with various matters arising from Mr. Cohen's work with and on behalf of the organization," according to the complaint in state court in Manhattan. "These matters included multiple congressional hearings, Special Counsel Robert S. Mueller III's investigation and others." In addition to recovering millions, the suit could provide Cohen with another avenue to reveal documents he obtained from the Trump Organization. As the case moves forward, Cohen may add emails, contracts and records as exhibits. He may also try to depose senior executives of the Trump Organization, including the president himself. "Michael Cohen has proven with documents and facts that the president of the United States has lied and committed crimes," one of his attorneys, Lanny Davis, said in a statement. "Stubborn facts backed up by documents, such as signed criminal hush money checks, can't be ignored -- unless you are President Trump and his apologists. While I'm not involved in this lawsuit, rest assured, Michael Cohen has documents to prove the allegations in this complaint as well." Cohen, who has pleaded guilty to nine felonies stemming from a federal probe into campaign violations and other crimes, claims he's out at least $1.9 million in fees and costs and another $1.9 million in penalties, which the company promised to repay. Trump Organization spokeswoman Amanda Miller didn't immediately respond to a request for comment. 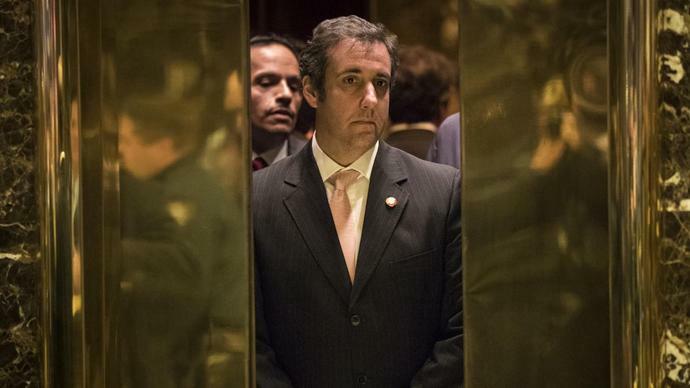 The complaint includes details of Cohen's work on behalf of the Trump Organization, such as organizing hush payments to women claiming to have had extramarital affairs with Trump. As he did before Congress, Cohen said he acted at Trump's direction. Cohen's lawsuit also renews an allegation that's dogged Trump for much of his career: He has a penchant for cheating people out of money he had promised them. Whether it's small business owners, contractors or lawyers, when Trump isn't happy he refuses to pay. What once was a cozy relationship between two tough-talking outer-borough New Yorkers has devolved into a public fight before millions. Cohen, who made himself valuable to Trump by burying his potentially embarrassing deeds, is now trying to revive them in an effort to reduce his time behind bars. Trump, threatened by a now-disloyal former employee, has sought to denigrate Cohen to his nearly 59 million Twitter followers by raising questions about his family members and accusing him of rampant lying. The Trump Organization agreed around 2017 to reimburse Cohen for legal fees and costs in connection with his defense to Mueller's probe and other matters, according to the complaint. The company and Cohen were pursuing a joint defense at the time. The Trump Organization initially honored its commitment, Cohen said, and paid $137,460 to McDermott Will & Emery LLP in October 2017, representing half the firm's unpaid invoices at the time, while promising that the campaign would pay the rest the following day. The company reaffirmed its commitment that December after Cohen complained to Donald Trump Jr. and Eric Trump about the delays, and it continued to pay through May 2018 -- reimbursing more than $1.7 million through direct payments, funding from Trump's campaign and credits from McDermott, according to the lawsuit. But the company stopped paying the invoices the next month, when reports emerged that Cohen was planning to cooperate with Mueller's probe and federal prosecutors in New York, forcing McDermott to withdraw and Cohen to find new lawyers, according to the suit. A total of $1.4 million is still owed to McDermott, Cohen said. Cohen said he wrote the company in January asking to be reimbursed for his legal fees and got no response. The fees Cohen is seeking are distinct from the $420,000 Trump paid him to cover hush payments he made on the president's behalf to adult-film star Stormy Daniels. Daniels, whose legal name is Stephanie Clifford, also sued Cohen seeking to invalidate a non-disclosure agreement and claiming he defamed her. Cohen wants the Trump Organization to cover the legal fees related to those lawsuits. The case is Michael D. Cohen v. Trump Organization LLC, 651377/2019, New York State Supreme Court, New York County (Manhattan).